Thalwil, Switzerland – February 17, 2016 – u‑blox (SIX:UBXN), a global leader in wireless and positioning modules and chips, announces the release of NEO‑M8U, the industry’s first Untethered 3D Dead Reckoning (UDR) module. Combining multi‑GNSS (GPS, GLONASS, BeiDou, Galileo) with an onboard 3D gyro/accelerometer, NEO‑M8U provides accurate positioning even where GNSS signals are weak or not available. It achieves this without any connection to the vehicle other than power. The u‑blox NEO‑M8U module provides superior multipath suppression, which improves position accuracy even in tough environments, such as urban canyons, tunnels, or parking garages. For example, in London’s city center area, NEO‑M8U is typically three times more accurate than a traditional GNSS receiver. In addition, NEO‑M8U offers instantaneous position immediately after power‑up, without the need to wait for a first fix as with regular GNSS receivers. One of the key advantages of NEO‑M8U is the ease of product development and installation. NEO‑M8U looks and behaves just like a regular GNSS receiver and does not require any special mounting or connection to the vehicle. Thanks to its intelligent sensing and continuous self‑calibration, NEO‑M8U can be installed in the vehicle in any orientation. Other features are its real‑time update rate of up to 20 Hz benefiting a smooth navigation behavior, as well as the high‑speed access to the raw sensor data allowing for driving behavior analysis and detection of sudden acceleration, such as during an accident. NEO‑M8U will be available in early Q2, 2016. It can upgrade any existing NEO design due to the inherent pin and software compatibility to other NEO modules. NEO‑M8U will be displayed at the u‑blox booth (Hall 5: 5‑158) of Embedded World. Swiss u‑blox (SIX:UBXN) is a global leader in wireless and positioning semiconductors and modules for the automotive, industrial and consumer markets. u‑blox solutions enable people, vehicles and machines to locate their exact position and communicate wirelessly over cellular and short range networks. With a broad portfolio of chips, modules and software solutions, u‑blox is uniquely positioned to empower OEMs to develop innovative solutions for the Internet of Things, quickly and cost‑effectively. With headquarters in Thalwil, Switzerland, u‑blox is globally present with offices in Europe, Asia and the USA. Qvivr-founder Ashutosh Dhodapkar introduces the SWYP, an electronic credit- and loyalty card replacement to make your wallet thinner! A super-slim Bluetooth Smart SoC enables enhanced security using your phone for authentication via Nordic Semiconductor. The SWYP Card is designed to seamlessly integrate into our everyday lives. It begins with a revolutionary paper-thin PCB board that is populated with the tiniest components available. It goes through a series of assembly processes that result in durable metal cards that pass our rigorous tests. Its dynamic magnetic stripe means that a single card can now change into another at the press of a button. The display is optimized to show you exactly the information you need, and the prediction algorithms determine exactly when you need it. All of this technology now fits inside a card that is less than 0.8 mm thick. Meet the simple, sleek, secure SWYP card. The NEO-M8P is ideal for applications requiring vehicles to move faster and more accurately, operate without physical boundaries (e.g. wires or fences), and automatically return to base station platforms. Such applications include UAV, unmanned vehicles (e.g. robotic lawn mowers), and Precision Agriculture guidance. The NEO-M8P module enables the system integrator to access u-blox’s complete end-to-end RTK solution including the stationary “survey-in” functionality that is designed to reduce the setup time and increase the flexibility of the application. NEO-M8P modules are compatible with a wide range of communication technologies (Cellular, WiFi, BlueTooth, UHF) enabling the user to select the communication link best suited to their application. With u-blox’s RTK technology, integration and software development efforts can be reduced, ensuring a minimal cost of ownership. 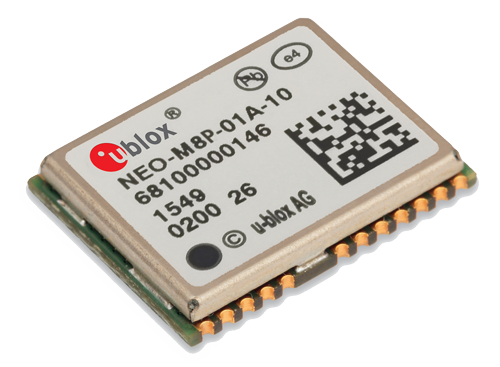 u-blox M8 modules use GNSS chips qualified according to AEC-Q100, are manufactured in ISO/TS 16949 certified sites, and fully tested on a system level. Qualification tests are performed as stipulated in the ISO16750 standard: “Road vehicles – Environmental conditions and testing for electrical and electronic equipment”. Thalwil, Switzerland – February 15, 2016 – u‑blox (SIX:UBXN), a global leader in wireless and positioning modules and chips, launched today the NEO‑M8P GNSS receiver modules delivering high performance down to centimeter‑level accuracy. Measuring merely 12.2 x 16 x 2.4 mm, NEO‑M8P is the smallest high precision GNSS RTK (real time kinematic) module available on the market based on GPS and GLONASS satellite‑based navigation systems. The rover with the u‑blox NEO‑M8P­‑0 receives corrections from the u‑blox base receiver NEO‑M8P‑2 via a communication link that uses the RTCM (Radio Technical Commission for Maritime Services) protocol, enabling centimeter‑level positioning accuracy. The RTK algorithms are pre‑integrated into the module. As a result, the size and weight are significantly reduced, and power consumption is five times lower than existing solutions, thus cutting costs and improving usability dramatically. Customers can further reduce their R&D efforts, as they do not have to spend significant resources and time to develop an in‑house RTK solution on a separate microprocessor system. RTK technologies have been used for some time in low‑volume niche markets, such as surveying and construction. Due to high costs and complexity, this enhanced positioning technology has been inaccessible for most other uses. Emerging high volume markets, such as unmanned vehicles, require high precision performance that is energy‑efficient and low in costs. Other application areas include agriculture and robotic guidance systems, such as tractors or robotic lawnmowers. The u‑blox NEO‑M8P answers these demands for a small‑sized, highly cost‑effective, and very precise RTK‑based module solution. u‑blox NEO‑M8P is available for sampling now and will be shipping in volumes in Q3’ 2016. NEO‑M8P will be displayed at the u‑blox booth (Hall 5: 5‑158) of Embedded World. u‑blox (SIX:UBXN), a global leader in wireless and positioning modules and chips, today announced the LILY‑W1 single band 802.11n 2.4 GHz Wi‑Fi transceiver module. This ultra‑compact host‑based module, measuring just 10 x 14 mm is suitable for providing Wi‑Fi connectivity to an increasingly broad range of industrial and commercial products with LTE connectivity. LILY‑W1 simplifies the integrator’s RF design efforts with an integrated antenna and enables Wi‑Fi in‑device co‑existence with LTE thanks to a bulk acoustic wave filter. Suiting today’s space constrained designs, the filter not only ensures that Wi‑Fi performance does not deteriorate in proximity of an LTE transceiver, but allows the antennas of both transceivers to be sited close together. The new module also supports Wi‑Fi direct. LILY‑W1 connects to the host processor, either through SDIO or USB, and can operate concurrently in Client and Micro Access Point modes. Up to 8 clients can attach when functioning as a Micro Access Point. Royalty free Linux and Android drivers are provided as standard. With its extended temperature range from -40 to +85 degrees C, the module suits the growing need for industrial and commercial equipment to become connected. Typical applications can include telematics control units, drive recorders or OBD readers, as well as logistics or point of sales equipment. Swiss u‑blox (SIX:UBXN) is a global leader in wireless and positioning semiconductors and modules for the automotive, industrial and consumer markets. Our solutions enable people, vehicles and machines to locate their exact position and communicate wirelessly over cellular and short range networks. With a broad portfolio of chips, modules and software solutions, u‑blox is uniquely positioned to empower OEMs to develop innovative solutions for the Internet of Things, quickly and cost‑effectively. With headquarters in Thalwil, Switzerland, u‑blox is globally present with offices in Europe, Asia and the USA.